The Belladonna Lily comes in white and pink forms, and are sometimes known as ‘Naked Ladies’. The flowers appearing on bare stems before the foliage. Flowering in late summer through to autumn they provide masses of flowers and are easy care. Pink and white, pink and pure white forms are available. The rare white flowering Amaryllis Belladonna “Alba” is a particularly attractive form and like its pink relative, will reach a height of 75cm plus. The white fragrant flowers appear on a bare stalk before the foliage, hence the name (although Belladonna actually means beautiful lady). Belladonna Cyclamen Pink A strong pink flowering form, tall cultivar with fragrant flowers. If you are looking for a tough reliable bulb then this Amaryllis could be it. Excellent in a well drained sunny position in the border and equally at home in a container. The flowers appear on tall stems before the foliage, hence the name ‘naked lady’. The late summer rains bring on the flowers, so in dry seasons a little water will be needed. The number of individual flowers on a stem can vary depending on the season and the size of the bulbs. On a mature sized bulb in good conditions up to 10 flowers will appear on each stem. An apricot yellow tinge to the throat adds interest. Care Plant in a well drained soil in a sunny position. Make sure that the neck of the bulb is just above ground level. Water after planting with a liquid seaweed fertilizer. Bulbs are generally available for sale by mail order from September to December at around $5 – $6 each. Best planted in a small clump for a great display. 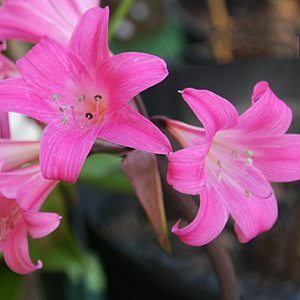 Amaryllis belladonna, or Naked Lady are drought tolerant bulbs from South Africa. Flowers appear in late summer before the foliage. Pink flowering forms and white flowering forms are both available for sale online in Australia. Although they are a sun loving bulb we find that they flower a little better with some afternoon shade. Belladonna Lilies are easy to grow and cope well with dry conditions. Large bulbs can be planted until early summer and do well in rock gardens or pots where they receive good sun and drainage. Bulbs are planted with the shoulder or neck above soil level. 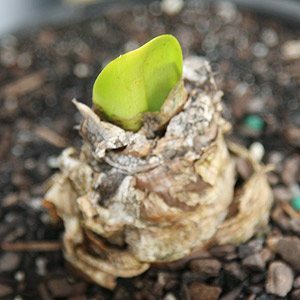 Propagation is easy by division, Amaryllis belladonna can also be grown from seed, they are easy to care for, require little water and provide excellent cut flowers. Fertilize with a slow release fertiliser in early spring, top dress with some blood and bone at the same time. Sun – Full sun to afternoon shade, although dappled shade in warmer areas is acceptable but may inhibit flowering a little. Care – General all purpose fertilizer in spring, leave foliage to die back before removing. Divide established clumps to prevent overcrowding in late winter to spring.